Cracking the Millennial code can be tough, and the cruise industry is no stranger to the issue of how to woo the next big generation of cruisers. After spending a week on board Celebrity Summit, including a chat with Captain Kate McCue, a Gen X'er who barely falls beyond the upper limits of what is considered the Millennial Generation, here are the things I found to be most popular with the under-34 crowd. Summit is outfitted with the next generation of Wi-Fi, dubbed by the company as Xcelerate. The promise is higher speed Internet in more places throughout the ship. 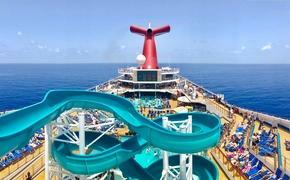 I personally found it to be far better than the Wi-Fi service found on most large ships. Millennials are so used to games and streaming entertainment that anything less would be viewed as substandard. Capt. Kate uses Xcelerate to video conference with her husband, who is a chief engineer for Royal Caribbean and currently cruising in Asia. These two bars actually merge into one area, with frozen bar tops, LED lighting, and specialty drinks that complete the Millennial vibe. The space around the bars has seating for group hangouts surrounding the grand foyer staircases. This whole area hums with activity in the evening, as if everyone is just waiting for a DJ to get the crowd on their feet and dancing. Dancing around the Martini Bar is exactly what happens when the innovative pop-up disco takes place using headphones with color-coded flashing lights. Each headset is tuned to one of three channels: oldies, disco, or contemporary, each with a different color so you can see who is dancing to what. In the end, the color doesn't seem to matter, everyone is just dancing the night away together to the beat of their own drummer. This is a hot spot for all ages, but Millennials especially tend to gather here for the coffee, chai tea, pastries, and coffee house vibe. Passing through this area on deck five feels like walking through a sidewalk café. Opposite the coffee bar is the Gelateria, with the same atmosphere. It's no surprise then that Capt. Kate calls Café al Bacio her favorite spot on the ship. She likes to pop in and work behind the counter on sea days, handing out Nutella croissants, but leaving the coffee making to the professionals. Steam-table buffets are not a Millennial favorite. Summit's Oceanview Café includes so many cook-to-order spots that it becomes hard to choose and easy to forget that you are at a buffet. The top favorites seem to be the pasta stations at lunch and in the evening and the six egg stations, including two dedicated to poached eggs, at breakfast. The serving area at the very back of Oceanview, facing the Oceanview outdoor bar (another Millennial hotspot) is a flexible custom food station where we even found Capt. Kate lending a hand serving peel-and-eat shrimp during the lunch rush. Even the Pool Grill serves burgers and dogs topped your way. This may seem like a small thing to some cruisers, but Millennials are choosey and often price conscious. I visited with a young couple at the end of the cruise who raved about what a good time they had and the one specific thing they mentioned was the ability to bring two bottles of wine on board. They enjoyed having the wine they like most along for the cruise so they could enjoy a glass in their staterooms. 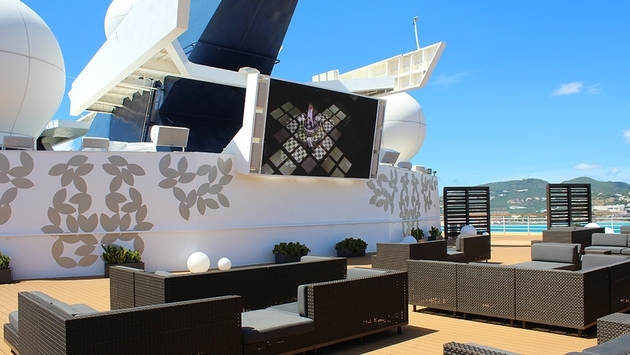 The Rooftop Terrace has a giant-screen TV, sofas, beach-style cabanas, and bar service. Can you think of a better place to watch the latest movie? One evening during the cruise, the area became a pop-up restaurant serving food chosen to match the movie. It may very well be that ability to create these seemingly non-cruise moments onboard that endears the ship to the younger crowd.